From the Book Jacket: Jim Panzee is in a terrible mood for no good reason. His friends just can't understand it - how can he be in a bad mood when it's SUCH a beautiful day? They encourage him to stop hunching, to smile, and to do things that make them happy. But Jim can't take all the advice...and has a BIT of a meltdown. Could it be that he just needs a day to feel grumpy? Why It's on My Bookshelf: This has been a really helpful book to introduce coping skills when kids are having difficulty regulating emotions. I like how the story ends with the monkey meeting a gorilla who is also having a hard day. Their conversation is a good reminder that everyone feels these feelings and eventually they will pass. I used this page of the book to talk about being still and silent and wait for the calm to come. 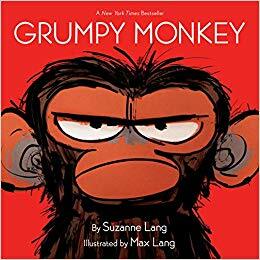 Love Grumpy Monkey!